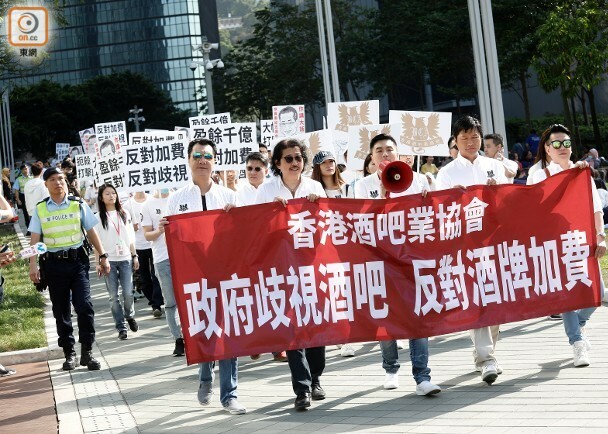 About 200 people joined a protest outside of the Hong Kong government office in Admiralty on 8 April against a government proposal that will drastically raise the liquor license application fee by as much as 15 times its current rate, calling the proposal “discriminatory” and “punitive” to the city’s vibrant bar scene. The protest organised by the Hong Kong Bar & Club Association was a response to an earlier proposal by the city’s Food and Health Bureau that seeks to raise liquor license application fees for issuing, renewal, transfer and amending, according to Chinese newspaper Wen Wei Po. Under the new proposal, which will be submitted to Hong Kong’s legislative council for review this week, the application fee for clubs would be raised from the current HK$1,100 (US$140) to HK$17,020 (US$2,168), and application fee for a new bar would also be adjusted from HK$3,940 (US$501) to HK$17,020. Meanwhile, one-year license renewal fee would be raised from HK$3,940 to HK$5,110, while a two-year renewal would cost HK$7,660. The proposed hikes have caused outrage among bar industry professionals. Chin Chun-Wing, vice chairman of the association, called the decision “outrageous” arguing that the government is sitting on financial surplus and the proposal is discriminatory against the bar industry, making reference to the fact that Hong Kong government had a reported HK$138 billion surplus last year. One of Hong Kong’s biggest draws to tourists, the bar industry should be supported instead of being suppressed by the punitive fees, he retorted. Additionally, he added that the bar industry provides job opportunities for young professionals. Hong Kong gave out 7,285 liquor licenses to different bars and clubs to the end of July 2016, according to a report by research company Frost and Sullivan commissioned by the Hong Kong Stock Exchange. But the association alleges that more than 100 bars and venues in the city are operating in industrial buildings without liquor licenses, causing potential safety concerns.